After making miso soup I had loads of tofu and noodles left so the obvious thing to make was some sort of tofu stir-fry. I am also completely addicted to purple sprouting broccoli at the moment, I have pretty much eaten it every night for the last two weeks! So that’s how this simple tofu recipe came about, don't be put off by the long ingredients list, it's very simple to make and full of flavour. Make the tofu marinate by mixing together the sweet chilli sauce, soy sauce, ginger, chilli, white wine vinegar and water in a bowl then chuck to tofu in and swish it around a bit so that it is covered in marinade. Cover with cling film and leave to soak for 2-4 hours. When ready to cook, heat the oil in a pan until very hot and boil another pan of water for the noodles. Roll the tofu in the corn flour (retain the marinade) then add to the pan turning frequently until all the sides are golden brown. Add the noodles to the boiling water. Then turn down the heat on the tofu, add the broccoli and stir-fry for 5 minutes until the start to soften. Add the sesame seeds and cook for a further minute, then strain the noodles and add to the pan. 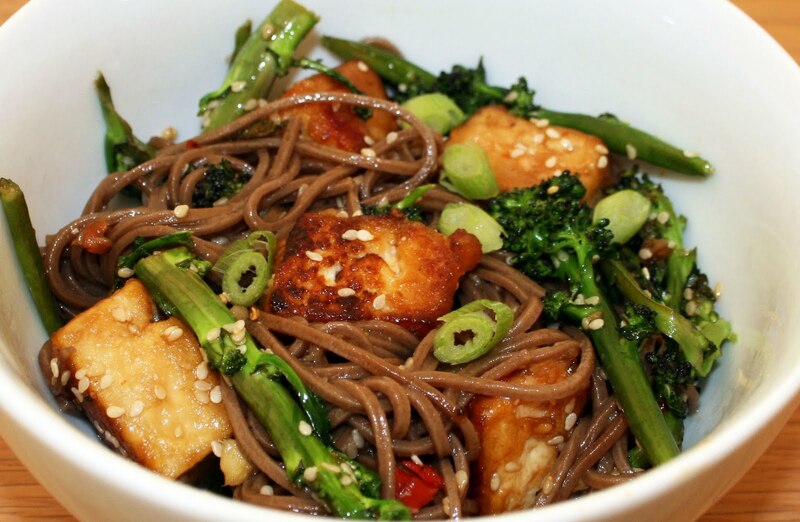 Cover the noodles and tofu in the marinade and mix well. Top with sliced spring onion and serve! Hi! I tried this recipe a few days ago and I liked it a lot. I couldn't find the noodles specified though so I made it with wholewheat spaghetti *blush*, and had to leave out the spring onions. The only minor complaint I have is that the sauce/marinade was a bit too salty for my taste, and next time I'd probably use less soy sauce. MMM, looks delicious, definitely going to cook this, thank you. Glad I found you through Kellie at Food to Glow. Ohh, this is what I want for my tea! Looks amazing. I love tofu but never feel that I get it right. I'm going to try your marinade..
Tofu is so hard to get right! I have had many failed attempts at it. I always freeze it first now, although I'm not sure if you're supposed to haha!